This weekend I was wondering if it is possible to use triangulation to pinpoint the position of an object using two ultrasonic sensors. So I made a simple robot and wrote a small program to find out. It proves this can be done. Triangulation is a technique that uses angles or distances between points to calculate the position of these points. GPS localization for example uses triangulation. The technique is based on the law of cosines. This law allows you to calculate the angles of a triangle given the lengths of its sides. But also to calculate the length of one side given the length of the two other sides and the angle of the opposite corner. This might sound complicated, but they teach it in high school, so you might know it. This means that a robot equipped with two US sensors can calculate the exact position of an object, provided it is in sight of these two sensors. Potentially, this could be a huge benefit. Because a single sensor has a wide (30 degrees) detection beam, giving much uncertainty about the exact location of an object. But a single sensor also deforms the apparent shape of an object. Practically this means that constructing maps using a single US sensor is impossible. Maybe, with two sensors and some triangulation a map can be constructed, as the position of the objects can be calculated. 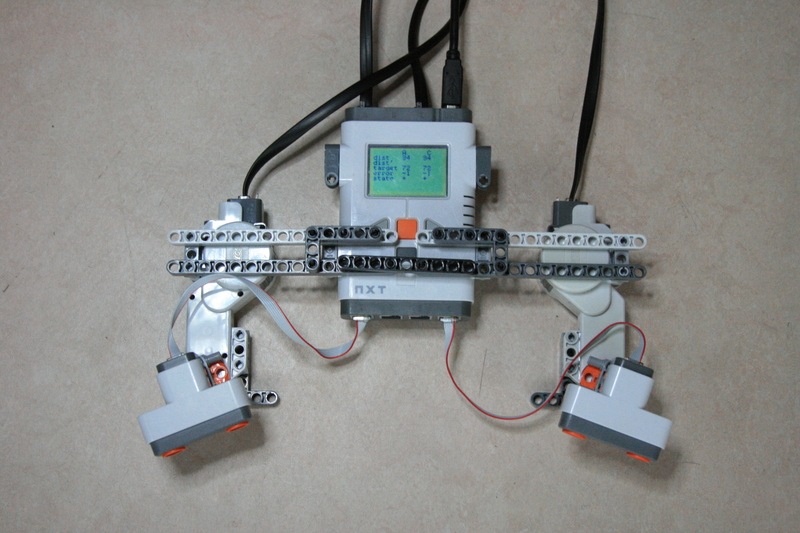 Here is a picture of the setup I used to test if it is practically possible to do this with two Lego US sensors. The sensors can be rotated as they are mounted on the shaft of a NXT motor. The sensors are constantly pointing to the object in sight. If no object is in sight the sensors point straight ahead, waiting for an object. It is clear to see from the rotation of the sensors where they are “looking” at. The effectiveness of the setup is clear to everyone. After some tests I am pleased with the effectiveness of this setup. It is accurate up to 2-4 cm. If this is enough to produce good maps I don’t know. But it is at least effective for a whole range of other tasks. I’m thinking of shooting cannons, search missions and object avoidance. The video gives you an impression. The effective range of the setup is limited as the picture to the right shows. I put a piece of Lego on every spot I got a successful hit. (The eleven hole beam is there for reference). It is not as wide or long as you might think. I think there are two reasons for that. the main reason is because of the low resolution of the sensor, just one cm. This causes numerical errors whose effects are small along the forward pointing axis, but that get larger to the sides. Offset error of the sensors is the second cause that limit the sideways effectiveness. Scale errors of the sensors limit the length of the effective range. You might wonder how good a rigid setup works. Then the sensors are not allowed to rotate and home in on the object. Well, obviously the field of view is much smaller, and the sensors should be placed facing inward to maximize field of view. But I noticed that the result is less accurate and stable. The program I wrote is very simple. It is just these two forms of the law of cosines embedded in some control structures. Thanks, Aswin for nice research! Do you mind if I re-post your code with comments on Russian on my blog? Sure, I will put your name as author of this code and also will add reference to your blog. It is al right to copy the code, after all I published it to share. But please note that I am using an experimental driver for the US sensors. The one that comes with Lejos works just as fine but you’ll need to change the code a bit. LcUltrasonic should become UltraSonicSensor and fetchSample() should become getDistance(). OK. Thanks! My main intent to re-comment this on Russian in order to allow people to do somthing like this on other languages: RobotC or NXC. Or may be even with other sensors. That’s a great experiment – I’m surprised at the accuracy of it, although the sensors are pretty good. I thought there would be a problem with 2 US sensors interfering with each other – did you do anything special to prevent this? Would it be even more accurate in determining distance to the object if you position each of the sensors not in horizontal but in vertical plane (like “8——8” instead of “oo——oo”)? No, that wouldn’t help. There is no difference between both axes of the sensor. Hi Aswin! Nice to see this! I’ve been thinking on and off about a robot that used two of the mindsensors NXTCams and triangulation to calculate exact position relative to the robot. Of course, that would require a fairly large initial investment, and I’m not sure as to the precision/resolution/accuracy of the measurements either. This would theoretically be possible, yes? Given the distance between the two cameras (one side of the triangle), and the angles of the cameras (the two angles of the base)? I was thinking something like ASA (angle-side-angle). This would be possible in theory. The Kinect does just that. I think it would be best to use that. I know Xander has hacked one to do just this. I’m working on a RoboCaddy to follow me around the golf course. I’ve been playing around with a few ping sensors and I would like to try your approach if its okay with you. Can I copy your code and play around with it? If so could you please forward me your code via link or email. Thank you so much for contributing your knowledge.